The 2013 Showcase of Homes starts this weekend in Saratoga County, and runs each of the two weekends after (September 21-22, 28-29; October 5-6). It's basically a self-guided tour of big/extravagant new houses. We checked this out a few years back. It was basically like walking through HGTV. It also made us wonder what people are doing with all that space in their bathrooms. Anyway, if the home design/remodeling/House Hunters thing interests you, there's usually some quality gawking. There are 14 homes on the tour this year. And unlike in some previous years, the homes are mostly grouped together geographically, near Saratoga Springs. 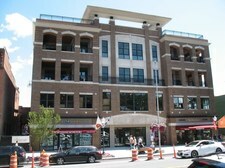 In fact, one of the homes on the tour is a condo in the new building on Broadway in Saratoga, "The Washington" (on the right). Tickets for the tour are $20, and are good for each weekend. There's also a "Comfort of Homes" event this Friday from 5-10 pm in which eight of the homes will be open and samples of comfort food from various restaurants -- including Maestro's, Prime, and Capriccio Saratoga -- will be available. Tickets for that are $25 -- or $40, including a tour ticket. Proceeds benefit Northern Saratoga Habitat for Humanity and Rebuilding Together Saratoga County.